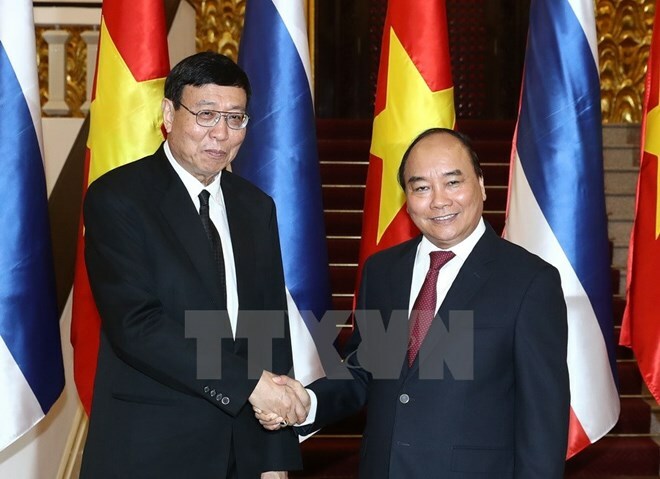 Hanoi (VNA) – Prime Minister Nguyen Xuan Phuc hosted a reception for President of the National Legislative Assembly of Thailand Pornpetch Wichitcholchai in Hanoi on August 14. The PM said he will lead a high-level Government delegation to visit Thailand from August 17-19 to exchange measures to promote bilateral friendship and cooperation, and increase the two countries’ strategic partnership. Vietnam and Thailand have enhanced coordination in various fields from politics, security, and defense to economics, trade, tourism, culture and society in recent times, Phuc said. Thailand is the biggest trade partner of Vietnam in ASEAN with two-way trade reaching 12.5 billion USD in 2016. However, as Vietnam ran a trade deficit of 5 billion USD with Thailand, Phuc hoped the two countries will seek measures to balance trade and increase the bilateral trade to 20 billion USD by 2020. The tourism cooperation also developed with about 800,000 Vietnamese tourists visiting Thailand in 2016 while over 200,000 Thais travelling to Vietnam, he noted. The PM proposed Thailand open its market for Vietnamese goods and create more favourable conditions for Vietnamese workers to work in the country as well as encourage Thai businesses to boost investment in Vietnam. Vietnam will address difficulties and create conditions for Thai investors to do business, he affirmed. For his part, Pornpetch highlighted the sound relations between Vietnamese and Thai legislatures. The two sides have exchanged ways to boost bilateral cooperation at international forums. Thailand and Vietnam are big trade and investment partners, he said, adding that they have pushed cooperation in other fields such as security, defense, and marine patrol.